Gracious father, please give us better eyes and more true hearts that we may value in all people qualities that reflect your character. Bless us as we raise our children that we may instill in them a sense of proper values. 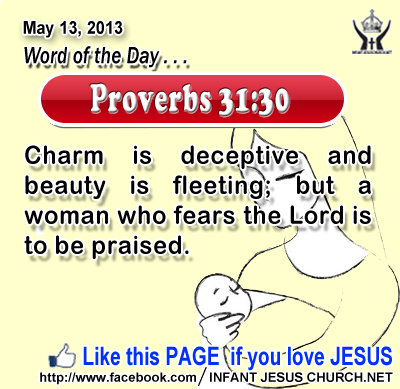 And dear God, please help us to value and praise women for their holy character. In Infant Jesus' name we pray. Amen. 29His disciples said, "Ah, now you are speaking plainly, not in any figure! 30 Now we know that you know all things, and need none to question you; by this we believe that you came from God." 31 Jesus answered them, "Do you now believe? 32 The hour is coming, indeed it has come, when you will be scattered, every man to his home, and will leave me alone; yet I am not alone, for the Father is with me. 33 I have said this to you, that in me you may have peace. In the world you have tribulation; but be of good cheer, I have overcome the world. The Lord Jesus gives us the gift of his Holy Spirit who supports us with faith, courage, and perseverance to stay the course which he has set for us. The Holy Spirit fills us with a living hope in the control of Jesus resurrection and reassures our heart with a confident trust in God's abiding existence. Nothing can separate us from the love of Jesus and the victory he has won for us. The Holy Spirit gives us the power and courage we need to overcome every adversity and to persevere with faith and hope in God. Do we believe in the power of Jesus' love for you and in the victory he has won for us through his death and resurrection? Loving Infant Jesus, help us to trust in your unwavering love and saving help, especially when we meet adversities, trials, and excitements. Give us your peace when we are troubled and let us know the joy of your victory over sin and death.